This Hubble Space Telescope image shows Sirius A, the brightest star in our nighttime sky, along with its faint, tiny stellar companion, Sirius B. Astronomers overexposed the image of Sirius A [at centre] so that the dim Sirius B [tiny dot at lower left] could be seen. The cross-shaped diffraction spikes and concentric rings around Sirius A, and the small ring around Sirius B, are artifacts produced within the telescope's imaging system. The two stars revolve around each other every 50 years. Sirius A, only 8.6 light-years from Earth, is the fifth closest star system known. 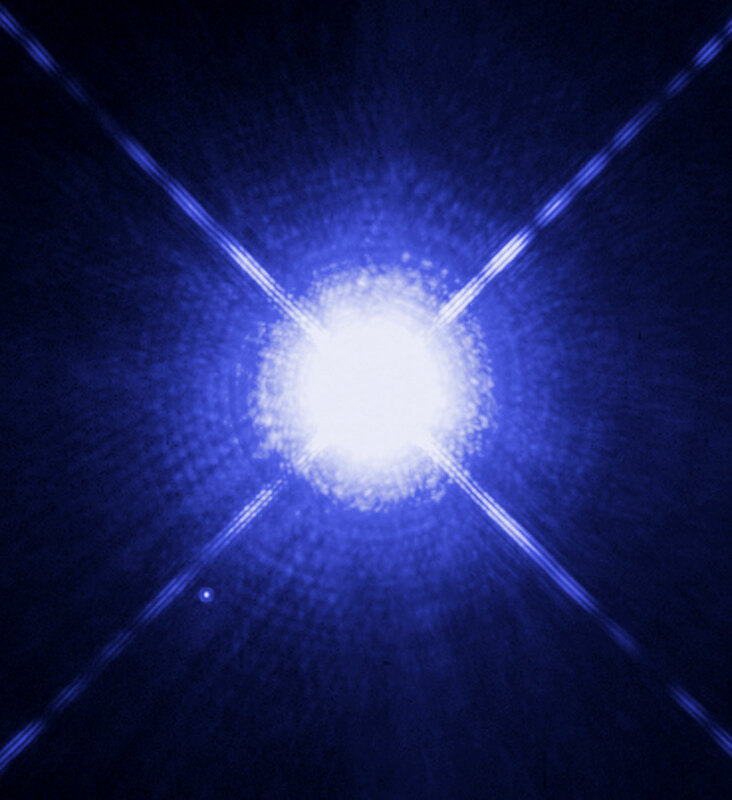 Sirius B, a white dwarf, is very faint because of its tiny size, only 12,000 kilometres in diameter. White dwarfs are the leftover remnants of stars similar to our Sun. They have exhausted their nuclear fuel sources and have collapsed down to a very small size. 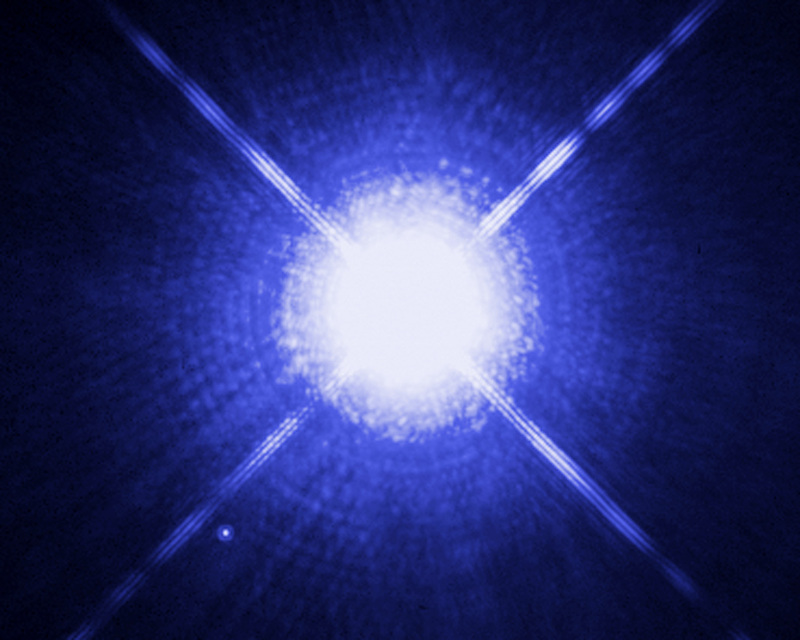 Sirius B is about 10,000 times fainter than Sirius A. 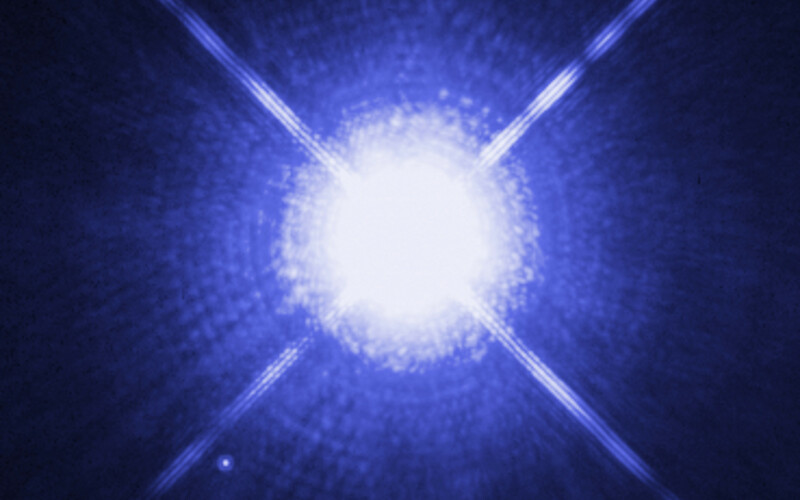 The white dwarf's feeble light makes it a challenge to study, because its light is swamped in the glare of its brighter companion as seen from telescopes on Earth. However, using the keen eye of Hubble's Space Telescope Imaging Spectrograph (STIS), astronomers have now been able to isolate the light from Sirius B and disperse it into a spectrum. STIS measured light from Sirius B being stretched to longer, redder wavelengths due to the white dwarf's powerful gravitational pull. Based on those measurements, astronomers have calculated Sirius B's mass at 98 percent that of our Sun. Analysis of the white dwarf's spectrum also has allowed astronomers to refine the estimate for its surface temperature to about 25,000 C.
Accurately determining the masses of white dwarfs is fundamentally important to understanding stellar evolution. Our Sun will eventually become a white dwarf. White dwarfs are also the source of Type Ia supernova explosions, which are used to measure cosmological distances and the expansion rate of the universe. Measurements based on Type Ia supernovae are fundamental to understanding "dark energy" , a dominant repulsive force stretching the universe apart. Also, the method used to determine the white dwarf's mass relies on one of the key predictions of Einstein's theory of General Relativity: that light loses energy when it attempts to escape the gravity of a compact star. This image was taken 15 Oct., 2003, with Hubble's Wide Field Planetary Camera 2. 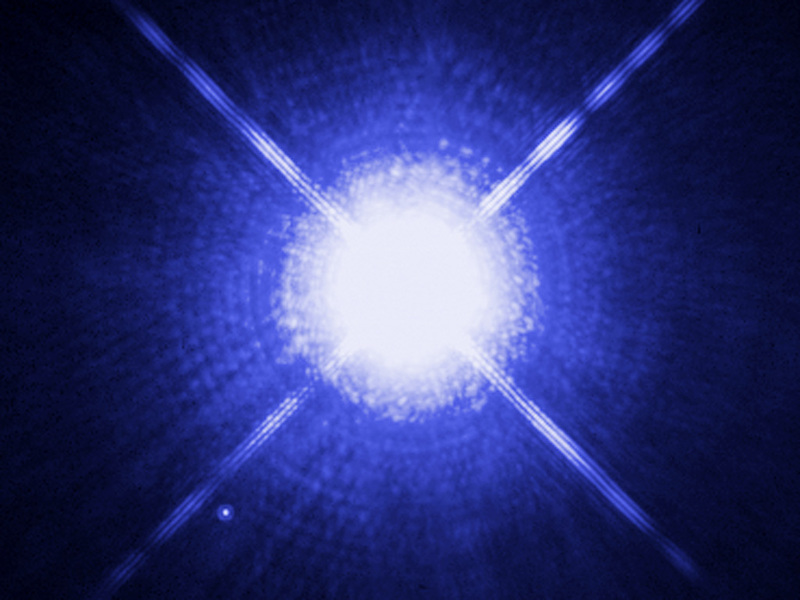 Based on detailed measurements of the position of Sirius B in this image, astronomers were then able to point the STIS instrument exactly on the white dwarf and make the measurements to determine its gravitational redshift and mass. Position (Dec): -16° 43' 0.02"